Well said. Id love to have multiple guild memberships on the same toon. Currently some of my closer friends in the game are in my old guild (the one with the inconvenient raiding times), but we manage to to keep in touch by creating our own chat channel. Theres a bit of conversation happens via RealID status messages too, twitter style. A cross game chat channel would be great for when Diablo III comes out; I know many will be playing that. The RealID Twitter thing can get very annoying, very fast, if people on your list are chatting to each other and you don’t care. All updates pop up on screen automatically for all your RealID friends and it’s either spammy or (if you don’t have all the chatters on your list) it’s like reading one side of a conversation. It might be a worthwhile communication tool if all your RealID friends belong to the same group… but I am *very* happy that my friends aren’t using it like that. Wow. That was extremely well-put. Considering the dynamics of a guild of decent size (not just a simple alt/bank/silly fun guild), it’s a combination of a wide array of social relationships. When WoW began, the only way to keep this mixture emulsified was the server and guild concepts. When I began playing, I didn’t even *know* I could play on multiple servers. Once I found out I could, I still didn’t see much interest, as everyone I knew was on Bloodscalp. Then I discovered Twitter, and got involved with the blogging community. I was getting to know people left and right who were fascinating and fun to interact with them. However, the walled garden of the server/guild concept prevented me from just being able to chat while playing with them. If I’m not mistaken, I thought Rift added a Twitter API in-game. When that happened, may people (including myself) would’ve loved to be able to tweet while in WoW. However, that wasn’t going to happen. So, I would roll alts. This works great when I had more time to play, but now my game time is at a premium. I raid with a great bunch of people, so I budget a large percentage of time for them to heal in raid. Well, that leaves precious little time for me to do the normal activities I’d do to support the raiding endeavors, such as gathering and gearing up. This puts me in direct conflict with my guild group and perhaps running with a Twitter friend on something quick, in the middle of the night. For me, the guild concept is one where you share a mutual respect and goal. So, if I’m not helping the guild drive to the goal, then I’m not being respectful to the others that are working hard (I keep threatening to post on this concept). We’ve joked on Twitter at times that it’d be cool to have a Twitter guild. In fact, we’ve had a few of these happen: is a wonderful concept of twinking and fun which I love, but haven’t had the time to participate. (correct me if I’m wrong) was a one-time Twitter event developed originally by Liala of Disciplinary Action, where it was a Twitter meet-up with everyone creating a DK on a given server, and we were to level together, break out of the starting zone so we could do some hilarious DK Battlegrounds. There are times when someone needs people to run something, and I’m just sitting there wishing I could help. I can’t, of course. The characters I have that could help are peeking over the garden wall, pouting. Evolving the guild concept and introducing bnet as the opportunity to bring the cloud concept to gaming would really be a game-changer. I still feel the guild concept is one I can’t let go of, so allowing it to evolve along with everything else comforts me. It sure was simpler when all you had was your server, faction and guild. However, getting to know so many talented and interesting people, I’m am excited and motivated to be an advocate for making the big changes that really are needed. How well do you think Steam does this? I don’t use it much myself, but my understanding is that it does many of the things you’re discussing with groups, and it has a significant player base as well. I don’t know very much about Steam, to be honest. Clearly that type of community within a community within a community with unlimited connectivity is the future of MMO…everything. Why exactly do guilds need to survive? LFR has already subverted the raid-access role that guilds played. Once the Battle Tag system is in place and assuming we’ll be able to group cross-server as easily as we do on a single server today, the guild as an organizing force loses a lot of importance. It becomes a buff. Instead of joining a guild, we should be able to create circles of RID friends formed around a particular activity like raiding or pvp or chatting or leveling. You can call these circles “guilds” I guess but I see them being far more organic, fluid and portable. This is a good question, and one I wrestled with in early drafts of this post. Guilds are persistent social entities, with an independent, tangible existence outside of the experiences of their members. Unlike a Google+ circle or Twitter List (which is defined by a user), guilds exist like corporations or bands exist – they’re only as good as their members, but they are more than just their members. Are they necessary? Possibly not. Could we move towards a structure where everyone functions like an independent contractor? Perhaps. But I think that there is still value in the idea of a guild, of choosing to organize into one, and that they’re worth keeping in a modified form. In their present form, they’re a roadblock to social network success. You know who might complain about a toon belonging to more than one guild at once? The royalty among the guilds, the ones who aim for the world firsts. They’d not be so pleased to have to compete against (effectively) an all-star team. Imagine the Yankees or Man U having to compete against the best of the other teams rolled together, and you get the idea. The one thing that an MMO still has over the tablet and smartphone games is complexity. Okay, graphics too, but the complexity of an MMO is hard to translate into the more simplistic interface of a tablet/smartphone. Because of that, I’m not too worried about MMOs ceasing to exist. Raiding at that level would get a heck of a lot more interesting, to be sure. I suspect that people would use the Armory API to scan and see what guilds were displayed. Or perhaps the API would return multiple values, which would make more programmatic sense. High-end raiding guilds would adapt. The tablet graphics are catching up. You can play Myst on the iPad, it’s a better experience than the original, and it’s not even the most advanced game. I think iOS/Android MMOs are not very far off at all. The tablet graphics are still not quite at 1440×900 yet, but yeah, they’re getting there. The thing is, however, to duplicate an MMO in complexity you’d need an external device such as a keyboard or an MMO mouse. I don’t think you’d want to be mashing an undersized keyboard on a Galaxy Tab or iPad screen while playing, and other traditional MMO raid-ish things such as drinking and/or eating snacks would cause an entirely new level of difficulty if you had to keep an MMO screen clean in order to play the game. The closer you come to needing the full keyboard and/or MMO mouse, the more you start to say “but wouldn’t a laptop be a smarter investment?” And you can actually make some (minimal) upgrades with a laptop, while you can make no upgrades with a tablet without simply replacing the tablet. Well, that’s really more a question of interface complexity rather than game complexity, don’t you think? The devices themselves are capable of handling WoW’s zone-based architecture (with enough disk space for swapping). I’m trying to imagine how players will interact in a tablet style MMO beyond a few set phrases, and while I can see that you could set up a mic/cam combo like Google+ to allow you to see your fellow raiders/party members (or maybe just see an avatar), I wonder how well that’ll work in practice. When you work from home, not everybody wants to see a webcam of you in your pajamas while you’re in a conference call. There’s also the matter of public space, in which an MMO player would likely intrude upon others’ enjoyment if they played a game that used voice to interact with all other players. If you change the paradigm entirely and create a Farmville-type of MMO –kind of what Sid Meier did with his Civ app– the tendency to create a game that mirrors the equivalent of doing dailies as it’s entire modus operandii won’t appeal to a lot of gamers. I suspect that a mobile MMO will not be a scaled down WoW or TOR, but rather an upscaled DS game. And I’m not so sure I’d be interested in that sort of game. Why not create a hybrid paradigm, where emotes are menu driven, but voice interactions are more common? Built-in voip for guild/friends, text to speech for general customer interactions? I find this discussion really fascinating not because I’m advocating one model or another, but rather because it’s causing me to stretch my grey matter a bit and think outside of what I think I want, and instead go with what might be possible. Don’t forget that the current MMO setup is, in itself, pretty radical when viewed from the lens of 20 years ago. I’m not trying to predict the death of the current MMO model. But I do see that there’s been a massive change in the social internet since MMOs were developed, and that change needs to be reflected in the current game structure if the game makers want them to stay relevant. The deeply immersive games aren’t really built for the tablet, because they require isolation and concentration that don’t truly cater to the mobility of the tablet. That doesn’t mean that you can’t have immersive games for the tablet –hell, any good game of chess will do– but the complexity of the UI in an MMO is something a tablet isn’t built for. A Skyrim, for example, would be better suited for a tablet than WoW in terms of the UI. Of course, Skyrim does require horsepower that tablets presently don’t have…. Wow has something even worse than the being able to play on different realms. If your friends are on a US server and you are on a EU server, you just have to wait till a non-blizzard game comes along that you both want to play. That’s an excellent point I’d forgotten. Being unable to play with folks across the pond is a technical and legal barrier they have to resolve. The server limitation is quite an issue for keeping up communications. When I moved to Germany from Colorado, I was prepared to pay to move my roster of toons, but found out that Blizzard says “that can’t be done”. I’m not sure why, since they can be moved within the US, and data is data. It probably has more to do with billing than any technical issues. Because of this, I’ve continued to play on US servers, and now have the problem of being out of sync with most server players, as I’m seven hours ahead of server time. Making the player’s characters visible across servers, and potentially across server domains, would really open up social interactions. I’m pretty sure that the EU/US (and asia realm) issue is probably a question of separate companies. Blizzard likely set up different corporations to administrate the servers in each locality, and that there are issues of customer separation which keep people from moving seamlessly around the world. 1. There are many parts of life where extending your reach to include as many people as possible has great potential benefits, but what’s the point of reaching out to millions of people just to “hang out and have fun”? Science thinks that we can only have meaningful social interactions with a very limited number of people anyway. 2. Everything you talk about centres around the idea of playing with already existing friends. Where did you make those? In small, enclosed communities! I don’t know about you, but I’ve never befriended anyone on Facebook, nor am I likely to become friends with some random stranger I run into in the crowds of a big city. IMO your model sounds like a great place to hang out with existing friends, but a lousy place to make any new ones. I think the very crux of the matter is being able to play with those who you know already. Any of them, no matter what server or faction. Obviously cross faction play would most likely need to be limited to instanced PvE dungeons and raids. Often I meet people in my personal or professional life who play but on a different server and/or the opposing faction. I want to be able to play with those people but not have to leave the ones I already play with on my server. Life puts contraints on my playtime so it is not practical to roll alts on various servers and level them. The point of open social networks is not that you can talk to millions of people, or have meaningful social interactions with all them, but rather that you can interact with those people of your choosing without artificial boundaries. I can interact with someone in India as easily as I can with someone across my town; the technology itself no longer presents any kind of barrier. It doesn’t matter what purpose the interaction serves – it could be business, it could be checking in on family, it could be “hanging out” – the technology enables that conversation. The development of telecommunications and voip services illustrates my point. Go back 20 years when making a transatlantic phone call cost 15-20 cents a minute. Could you do it? Yes. Did people do it? Only if they could afford it, which meant it was mostly businesses. Fast forward to today, when you can make a voip call to anywhere in the world for free. People no longer use the tech just for business – they use them to keep in touch with families and friends. Interpersonal relationships are possible now that weren’t possible back then. You can Skype someone in China or India for free. In WoW, this comes down to – I have some people I want to play with. Tools are being developed to remove the barriers that prevented me from doing it in the past. The faster those barriers go down, the better off the game will be. If Blizzard can create an architecture that allows breaking these barriers, they can create a platform which other games can leverage to accomplish the same thing, and the MMO industry wins. So how do we meet those people? Your second point is a curious one, and worth exploring. It’s touching on the root of RealID’s biggest mistake, the idea that you have to have already existing friends – in this case, outside of the game – to want to play with them. Opening the lines of communication allow you to meet more people, period, and it doesn’t matter how that happens. It could be at the grocery store or it could be in an LFR run, but we run into people all the time who we might want to spend more time with. I think about my social adventure through WoW. I don’t play with anyone I know IRL. I had two coworkers who started playing a while ago but stopped, and I never really played with them. I found folks on my server who let me into a guild, and a friend of one of the other members got me into a casual raiding guild later on. I had a friends list in pre-LFD Wrath of tanks I liked to run with. I was on a few RL’s lists as a solid and competent DPS. You meet someone in an LFR run. They are competent and nice in /r. They’re a class you’re looking for in your guild’s raid team. You strike up a conversation and they are friendly. After two hours of LFR, you’re of the opinion that you’d like to play with them again, and they’re of like mind. But they’re on a different server. Blizzard should do everything it can to make it so that that relationship can continue. Right now it’s not possible to bring them into your guild without a server transfer. It’s not possible to raid current content with them without paying $25. People are still going to meet people, no matter what. Thanks for taking the time for such a thoughtful reply! I’m not against tools that facilitate the forming of friendships across servers. The thing is, in my opinion completely breaking down server structures in a virtual world is not like having free phone calls… it’s like having everyone in the whole world move into your town, and that’s more oppressive than liberating! This isn’t just about exchanging words, it’s about people being in your (virtual) space. You talk about taking down ALL THE BARRIERS, but human beings need a certain amount of them simply to stay sane. Being faced with too many people at once, we start to view them as objects that are only in our way and should best be ignored. We do this in real life all the time when dealing with crowds and it’s perfectly normal – as long as people are able to snap out of that state of mind when needed, to realise that hey, that person they just shoved kind of rudely is actually a human being and doesn’t deserve that. Online it can be hard for many to ever truly perceive written words or avatars as real people and treat them accordingly, and IMO features like WoW’s dungeon finder and LFR have already shown that the problem only gets worse the more people you throw into the big anonymous pool to interact with each other. From my point of view, the game limiting you to a server that is a bit like a small town is part of WoW’s escapist appeal. I already have enough anonymous crowds in my real life; I don’t need them in my virtual world as well (with extra rudeness because they don’t think I’m a real person). Ben already came close to one of my points. he pointed out that bridging the gap between the US and EU was an even bigger obstacle. The only thing I would want was for Blizzard to recognize my account on US servers as well, so I’m not forced to either have two accounts or a lousy free-to-play account. That would be great! However, I play on EU and I know that certain nationalities have gathered on specific servers – fx Crushridge=Italian, Burning Legion=Polish. These are not official Italian or Polish servers but have become so unofficially because it made sense for the players (and they were numerous) to be able to have public chat channels in their mother tongue, and because for some, their English skills are not strong enough. I know that the Italian WoW players have been asking for their own group, like the Spanish, German, French and Russian for years, but have not yet been given it. What I’m trying to say is that this vision may be a little US centric. I don’t think the Italian players have that much interest in playing with the Polish players as much as you may not have much interest in playing with the Chinese and South Korean players. For the US (+Australia), I completely understand why none of you want to be tied to individual servers, but the issue may be more complex when looking abroad. Personally, if I had the choice between a global and a Scandinavian community, I’d probably go for the latter. How global do you want it to be and where would you draw the line? My point of view is somewhere in between yours and Cyn’s: if I had to choose between a global and a Romanian community, I would choose global in a heartbeat. My server (Alonsus) has a pretty even distribution of nationalities (maybe more Brits than usual) and I love it. I met people from dozens of countries, I’ve visited at least 5 countries to see guildies, I can debate language and culture pretty much any day… I see Romanians all day on the bus, so the ability to interact with different languages and cultures is one of the main things that’s keeping me interested in WoW. On the other hand, I would not get rid of the concept of guild. When my (international :P) friends and I made a guild of our own, I loved it. I fished for it, I tidied the bank, I took care of the website, I tried to stand the obnoxious mage we recruited… because it was ours. It hurt to see it die, but the experience was completely worth it. – guild chat – like Cyn said, it would be great to be able to chat with the guild without being logged into WoW. Even a browser-based IRC-type thing would be great. Also, the ability to create cross-server custom channels. My group of RL friends have a channel on Defias Brotherhood… but since I prefer to play on Alonsus I can either talk to each one separately on RealID or not participate in the conversation at all. – free server transfers. Rift has this and it sounds amazing. If I want to play with my friend on Wrathbringer over the weekend, I can just hop over on my geared char, with money and consumables, and have 2 days of fun… instead of trying to level an alt or paying 25 EUR for a transfer. A small cooldown should of course be placed on the transfer, and it might open a can of worms in regards to raid progression, but from a community POV I think it would be great. Blizzard needs to balance between allowing us to play with whomever we want and nurturing the server and guild communities. Crossserver battlegrounds, dungeon finder, and now raid finder have hurt the server based communities and guilds to some degree. Give us Battletags now: RealID is great, but there is no one on my list that I don’t know outside of the game. Sure some of these I met throught the game but became friends with and communicate with by email, facebook, or phone. 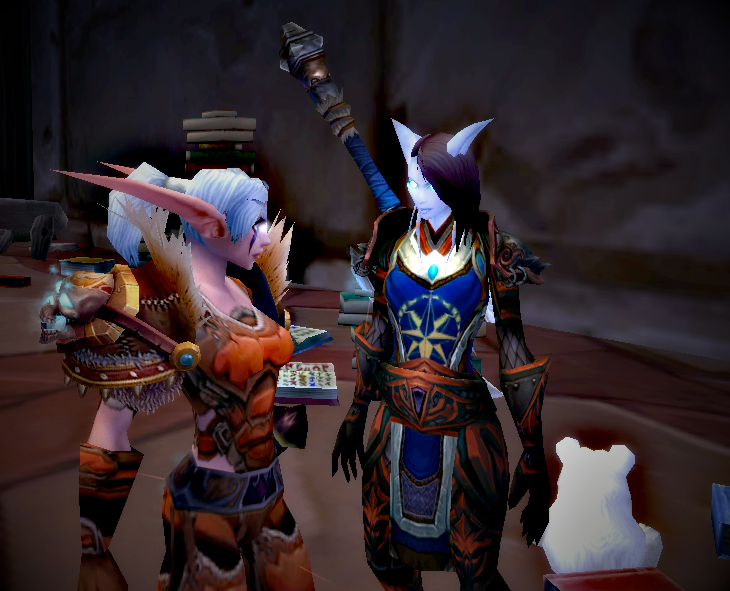 If I meet someone in Dungeon Finder that I think is cool and would like to play with, I am not going to just give out my RealID info. Battletags would allow me to tear down a wall that I am not otherwise willing to do. Create Battle.net guilds. These could simply be guilds such as we have now but extend past server barriers or could be guild alliances of server based guilds. Open cross faction grouping for isntanced dungeons and raids. I have some real life friends that play mostly horde. My main is alliance. Why can’t we all help Thrall take down Deathwing together? Integrate the forums and armory pages better. Make my toons armory page more like a Facebook profile so if I post on the forums it shows on my armory and I can add some sort of status updates. Guild armory pages whould be done similarly. Allow some sort of Facebook or Twitter tie in if I choose. Allow membership is in up to 3 server based guilds. My reasoning is you could stay in your casual social guild but still join a focused raiding and/or PvP guild to pursue those interests with out leaving your in game friends to do so. All 3 guild chats could be displayed at all times. Which guild is displayed under your name? They could have the guild tab function like the talents tab, you activate which one you want to use. This would also affect which guild bank you can access, where your rep gains go and so on. Allow the current tier of raid to be accessed cross-server but limit feats of strength and achievements for first kills to only server exclusive groups. Have server exclusive non-instanced content such as World Bosses, Holiday Bosses, and updated Wintergrasp and Tol Barad. I see why Blizzard may not want to spend dev time to making new WG/TBs but keep these 2 up to date and relevent to level cap characters. Guild improvements would be great. I would love to have guild housing, a place to hang out with your guildies, access guild vendors, and post to some sort of bulletin board.